Hot Air Balloon Lift Calculator are physic/math calculator to find Balloon Volume, Surface Pressure, Flight Altitude, Ambient Temperature, Envelope Temperature or Lift Force fast and easy. The lift generated by a balloon varies with temperature differential, that is the difference in temperature inside the balloon to that of the surrounding air mass and the air pressure. The buoyant force pushing upwards on the heated air inside the envelope. 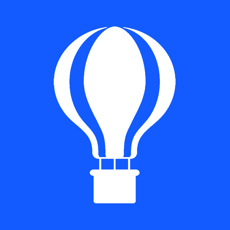 The hot air balloon components (such as envelope, burner, fuel tanks, gondola and passengers) must weight less than lift force in order for the buoyant force to be able to completely lift the hot air balloon off the ground. The lifting force from a hot air balloon depends on the density difference between balloon air and surrounding air, and the balloon volume.